Green Gables is a chalet style open plan cottage, ideal for couples and families of up to 6 people. It is privately owned and maintained. Located in the quiet village of Green Point, surrounded by National Parks. With beautiful views overlooking Wallis Lake. * 5 mins. drive to Seven Mile Beach. * 2 mins. walk to Wallis Lake - shallow clear water ideal for children. * 7 mins. drive to Forster Shopping Village. * 10 mins. to Pacific Palms popular beaches. Amenities for holiday makers include public phone, boat ramp, boat hire, Free tennis courts nearby. Within the town there is mainstream and boutique shopping, award winning restaurants and Clubs, a widevariety of experiences and activities and crystal clear water everywhere. The beaches around Foster all fabulous starting with Main Beach which is a protected beach, making it ideal for families. Nearby Pebbly Beach is also a good spot for families as is Burgess Beach. Other beaches not to miss include One Mile Beach and McBrides Beach, ideal to escape for a day. Seven Mile Beach stretches South from Cape Hawke down to Booti Hill and the Ruins, great for fishing and surfing. Green Gables is situated 3.5 hrs north of Sydney nestled halfway between Pacific Palms and Forster in the village of Green Point surrounded by National Park and lake. Beautiful beaches & lakes, Surfing, Fishing, Scuba-diving, Wind surfing, Sailing, Sailboarding, Kayaking, Dolphin cruises, Indoor Aquatic Centre, Cinema, Bowls, Golf, Tennis, Squash, Ten pin bowling, Horseriding, Bush Walking, Fine restaurants, Clubs & so much more. Green Gables is fully self contained and has a well equipped kitchen with an electric stove, microwave oven, refrigerator, electric kettle, toaster, sofabed/lounge, automatic washing machine, 2 showers, bathtub, 2 toilets, exterior clothes line, vacuum, air conditioned to main bedroom, outdoor setting & gas BBQ. The main bathroom has been fully renovated September 2016. Pricing is for 2 adults & 2 children, extra adults $15 per adult & $10 per child per night. Bring your own linen i.e. sheets, pillow slips, towels etc.. Pillows & blankets are provided. Pets are permitted but prefer not inside the cottage. The yard is fully fenced with undercover areas for your pets. There is a cabin for 2 extra guests on the property. Tennis courts in the area. 5 min drive. Thanks Eddie, we are glad you thought the house and views were great. Unfortunately we have never had any adverse feedback about the neighbours in 13 years. It would be reasonable to suggest that the peaceful, relaxing ambiance of the area was compromised, after the first night, by the arrival of an additional 14-16 people , in 5 cars, having dinner and listening to 'soft' amplified music on the open deck at the front of the property. If your intentions were known prior to booking we would have suggested you stay in a less peaceful , relaxed area. Lovely spot, and cosy house. All reviews were accurate and we had a lovely time enjoying the sunsets and the lake (3 minutes walk to an idyllic lakeside spot). We had a lovely time at Green Gables. 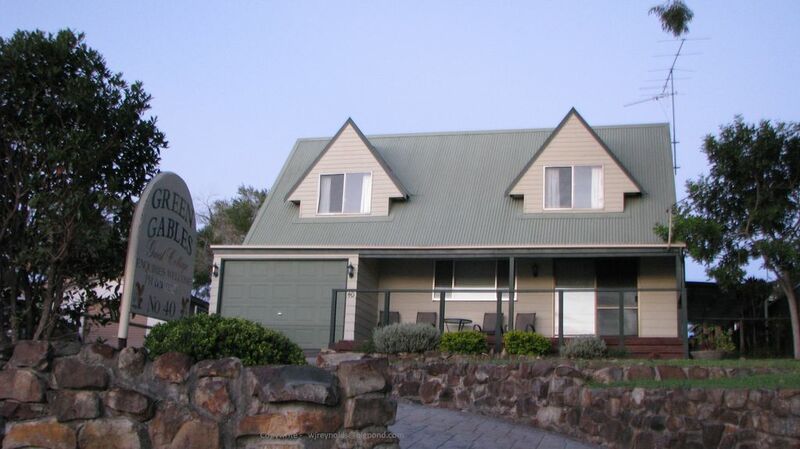 Great location out of the hustle & bustle of Forster and a fabulous view of the lake. Watching the sunsets from the front deck was amazing! House neat and tidy with a granny flat out the back and a cafe only 2 doors up. We highly recommend this property. Perfect location, lovely home from home. The cottage has a magnificent view of the lake and is only a few minutes away from the Forster shopping centre and other prime locations. The house was perfect for our needs. It was well equipped, attractive and comfortable. We thoroughly enjoyed our visit and would love to stay there again on future trips to the area.